Click on the “Browse” button and navigate to the downloaded “vintage-cafe.zip” file and click Install Now. 1. Extract the downloaded “vintage-cafe.zip” file. 2. 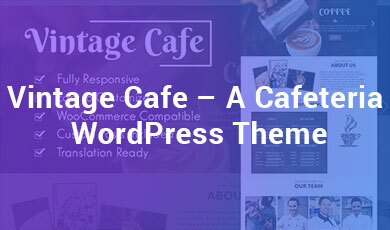 Upload the vintage-cafe.zip folder to the /wp-content/themes/ directory. Vintage theme requests featured images for all posts. It is used by all blocks and layouts to display your content. 3) Input the URL or you can upload your audio,video,gallery and so on from add media. Here you can give the identity of your site like site name, tagline, logo, favicon icon, banner image etc. 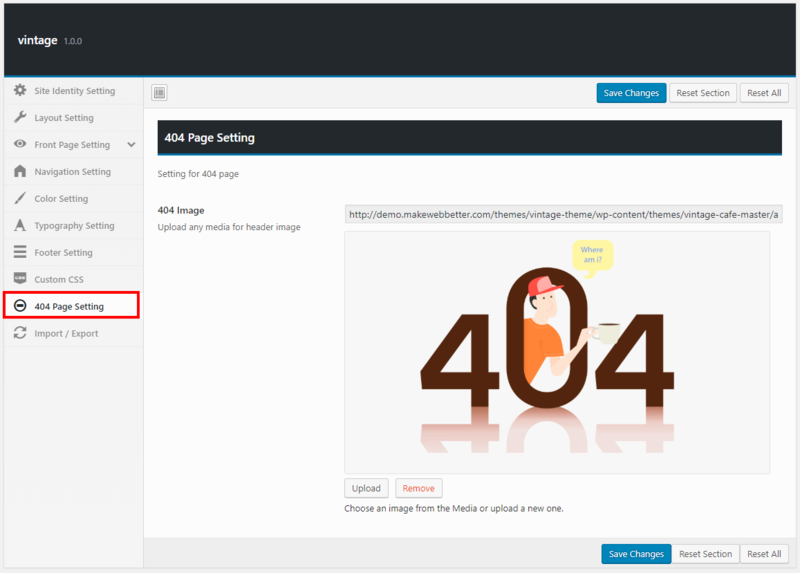 5) Site Banner Image: you can upload your banner image. 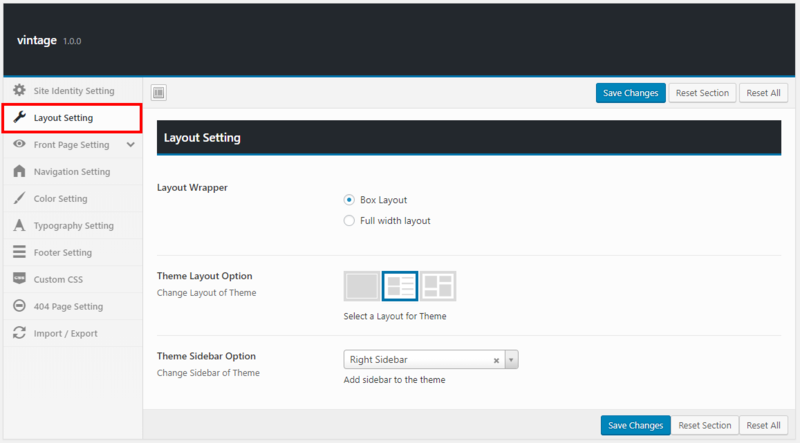 2) Theme Layout Option: we provide 3 type of option for the theme layout. 1) Select to show banner in the front page: Here you can upload your banner image of the theme. 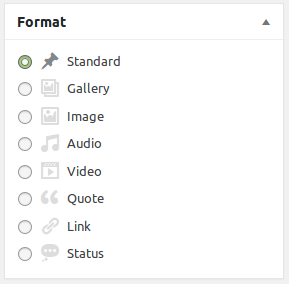 2) Select sidebar for the front page: You can upload images for the theme sidebar. 3) Select About us Section image: Upload the image to be shown in about us section in homepage. 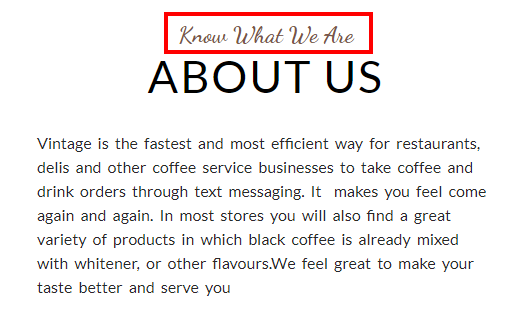 4) About us Text Editor: Write the text to be shown in about section in homepage. 5) Category for the menu: Select the category for the menu to be shown in the menu section in the home page. 6) Write a quote for the front page: Write the quotes to be shown on the homepage of the theme. 7) Select Gallery for the portfolio: Select the image to be shown in the Portfolio section of the home page. 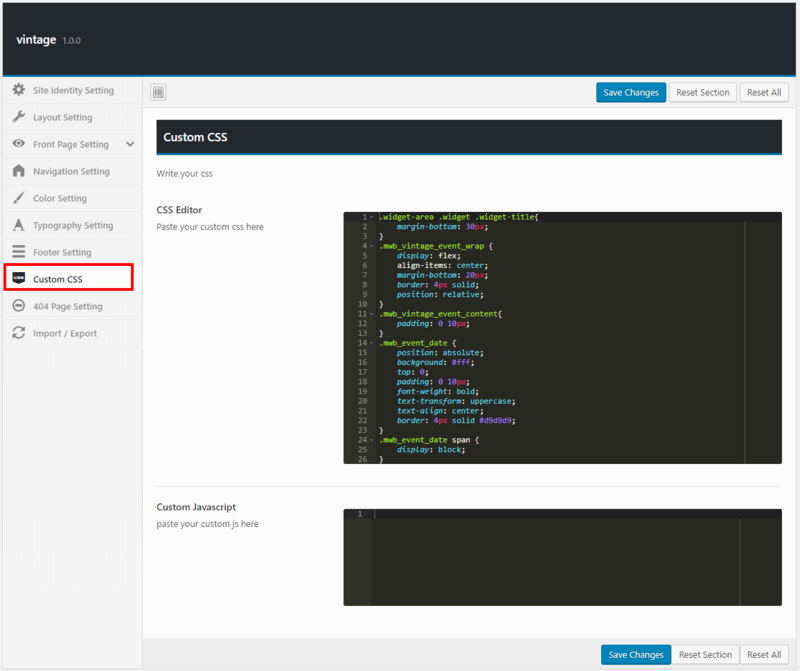 8) Front footer test Editor: Write the text to be shown in the footer in the homepage. 9) Reserve form Shortcode: Install contact form7 plugin and create a form to be displayed on the front page, paste the shortcode of the form in this field. 1) Fixed Header: Here you can be fixed the top header of the theme by on/off button. 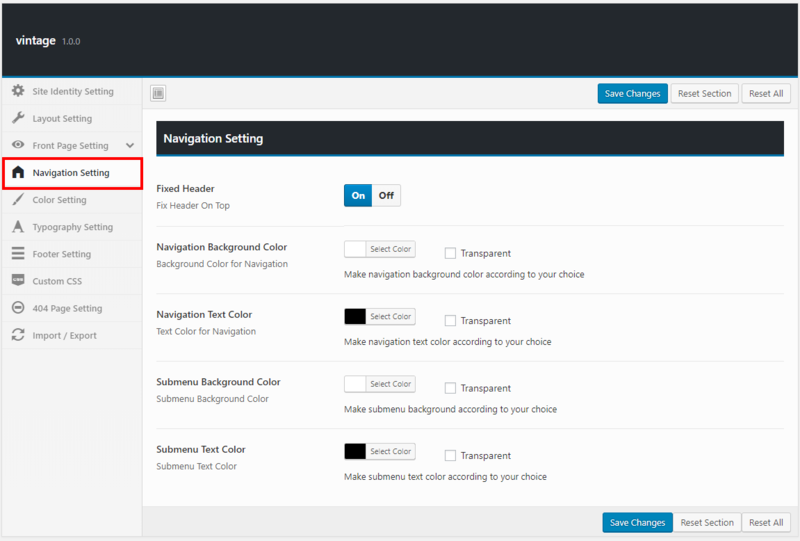 2) Navigation Background Color: set the header background color to be shown on the front page. 3) Navigation Text Color: You can select the header color to be shown on the front page. 4) Submenu Background Color: You can select the submenu’s background color. 5) Submenu Text Color: You can pick the submenu’s text color. 2.Theme Main Color: Here you can set the main color for the theme. 4. Theme Content Color: Here you can set the content color for the theme. Theme Button Background color setting: Here you can set the button color for the theme. Theme Button Hover After color option: You can set the color after mouse hovers on the button. Theme Button Hover Before Color Option: You can also set the color before mouse hovers on the button. 1. Site Title & Header Text Font: Set the Site Title and Header Text Font for the Theme. 2. Banner Text Font: Choose the different fonts for the banner of the theme. 3. Heading: Set Heading Text Font for Theme. 5. Site Content Font: In this section, you can set Font for Navigation and Footer. 1. Footer Widget Background: Set Background Color for Footer Widget Section. 2.Footer Copyright Section Background Color: Set background color for the copyright section of the Theme. 3. Footer Text Editor: Here you can choose the font for the footer content. 4. Show/Hide Footer Widget: Here you can show/hide the widgets of the footer section. 5. 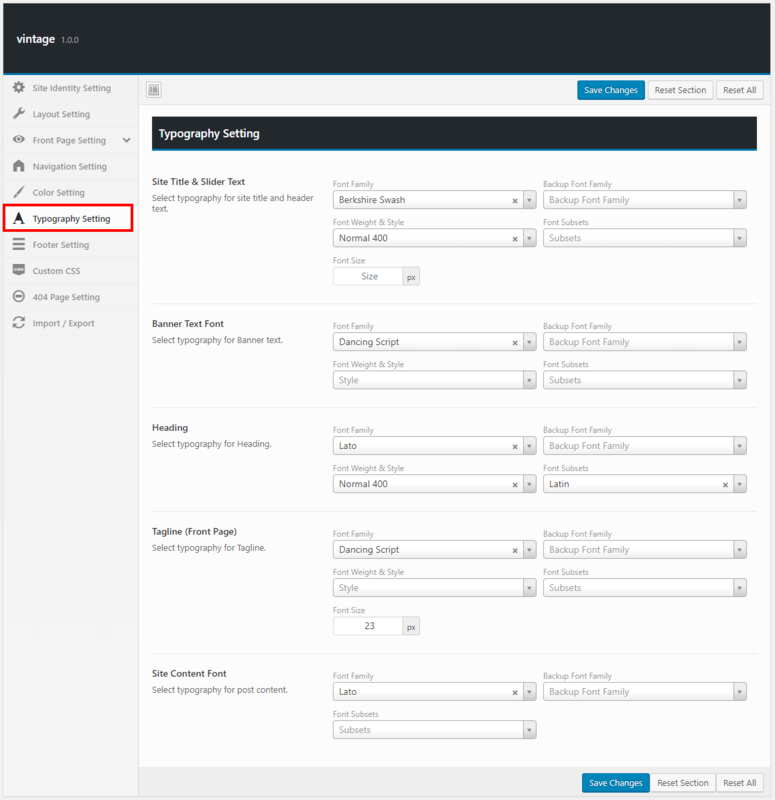 Number of Columns for Footer Widget: In this section, you can choose the number of columns to be shown in the footer of the theme. 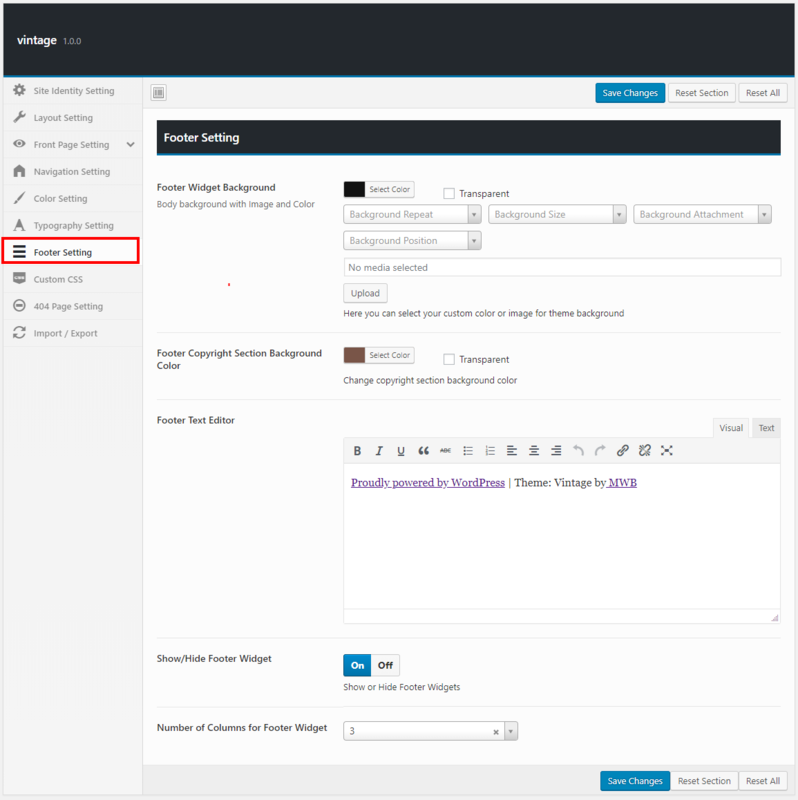 Add the slider to the Front Page, Navigate to Ventage Setting-> Front Page Setting -> scroll to “Select Slides to be shown in the slider in front page” setting and upload images for the slider. Add the slider to the Front Page, Navigate to Ventage Setting-> Front Page Setting -> scroll to “About us section” setting and upload the images and content for the About us section. 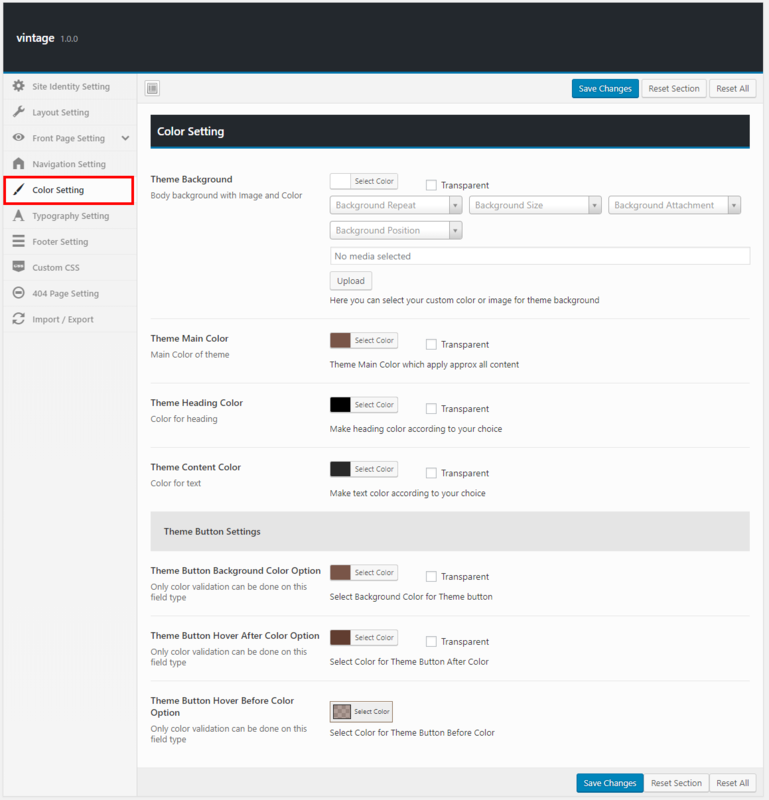 Add the slider to the Front Page, Navigate to Ventage Setting-> Front Page Setting -> scroll to “Category fo menu” setting and select those post which you want to show the most recent five posts in the slider. Add the Reviews to the front page, Navigate to Review-> Add new. Here you can write the content and give the featured image for the review section. Add the Team section on the Front Page, Navigate to Team-> add new. Here you have to add the content and featured images of the team members. Add the slider to the Front Page, Navigate to Ventage Setting-> Front Page Setting -> scroll to “Select Gallery For Portfolio” setting and select those pictures which you want to show in the Gallery portfolio. Add the Reserve Section to the Front Page, Navigate to Ventage Setting-> Front Page Setting -> scroll to “Reserve Form Shortcode”. 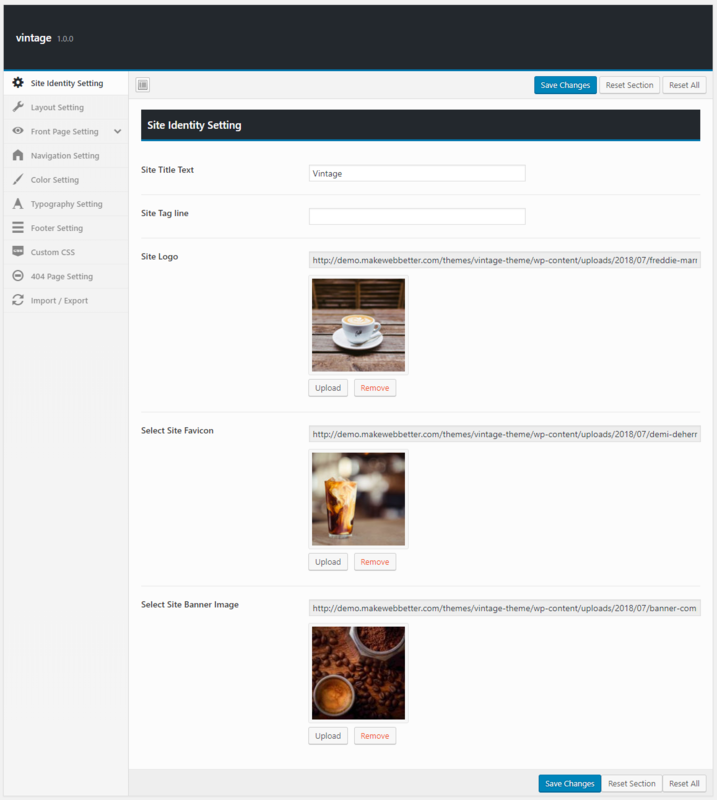 For this section firstly you need to install contact form7 plugin and create a form to be displayed on the front page, paste the shortcode of the form the given field. Add the Google Map to the front page, Navigate to Ventage Setting-> Front Page Setting -> Google Map Setting. 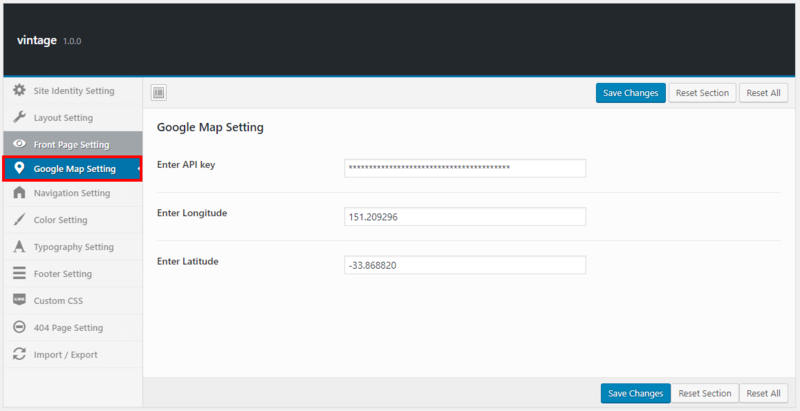 Enter the Google API key and set the longitude, latitude. 2) Woocommerce Sidebar: This is the sidebar in your theme used to show widgets in Woocommerce Pages. 4) Newsletter Widget: This sidebar is used to display Newsletter widget in the footer of the Homepage. 1) Vintage About Me Widget: This widget is used to display about the User, the widget includes image and description. 2) Vintage Categories Widget: This widget is used to show categories in the widget along with their post count. You can place this widget in sidebar and footer as well. 3) Vintage Contact Info Widget: This widget is used to show Contact Information like contact no, Email and so on. 4) Vintage Featured Post Widget: This widget is used to display featured post of the theme. 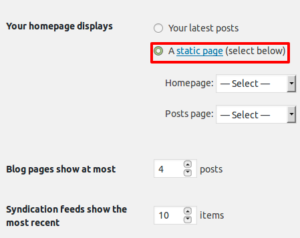 5) VintageRecent Post Widget: This widget is used to display Recent Post of the theme. 6) Vintage Social Icons: This widget is used to display Social Icons in the theme.